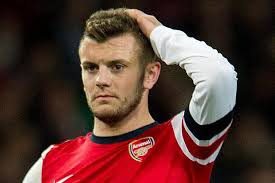 Arsenal midfielder Jack Wilshere is suspected to have a hairline fracture of his shin which could keep him out for longer than the 3-5days that coach Arsene Wenger had estimated after lifting the Community Shield on Sunday. According to The Mirror, Wilshere was injured by a tackle from defender Gabriel during a training session. If surgery is required he could miss three months and even without an operation it could be up to 8 weeks on the sidelines for the England man whose bad luck with injury now seems almost cruel. He was absent from November to May last year after a shocking Paddy McNair challenge almost snapped his ankle, and this latest problem has come because of another tackle – albeit from a teammate. Whether it speaks to an underlying weakness that’s too easily damaged remains to be seen, but it’s a hammer blow for Wilshere who had spoken about his fitness and desire to remain injury free this season.